What role should authorizers play in overseeing charter school special education policies and practices? Special education and charter schools is a highly contentious issue in educational policy and practice these days. What do authorizers think about—and what are they doing to address—a number of these complicated and challenging issues? NACSA’s 2015 survey of the nation’s authorizers explored a number of special education oversight and accountability topics. Here is what survey respondents told NACSA. NACSA asked authorizers if they use certain special education oversight and accountability practices, either currently, or at least once over the last two years. Authorizer use of these specific practices varies, and oversight practices are the most heavily used. Authorizers were asked about which practices they would require of authorized schools in addressing special education challenges. “Yes” responses mean either the practice was used over the last two years, the practice is currently in place, or the authorizer would consider using this practice in the future. Authorizers have, are, or will consider requiring schools to use a range of interventions. The most frequently cited practice was requiring schools to access effective practices at forums or technical assistance meetings (49.3%), and the least frequently mentioned practice was revoking or not renewing a charter for persistent special education violations (13.2%). More than three out of four authorizers (76.4%) agreed or strongly agreed with the principle of proportionality: that charter schools should enroll students with disabilities at rates similar to the local community where the charter school is located (or for statewide schools, the state rate). 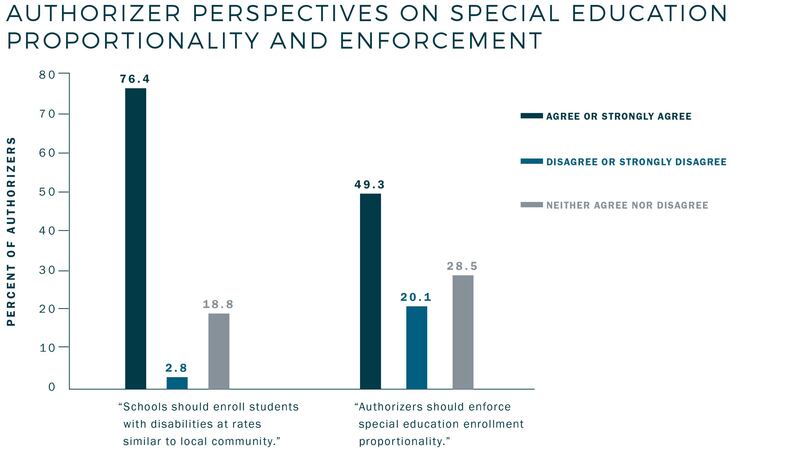 Authorizers were split on the degree to which they should enforce special education enrollment proportionality: nearly half of authorizers (49.3%) agreed or strongly agreed that authorizers should enforce special education enrollment proportionality, while the other half either disagreed or strongly disagreed (20.1%) or neither agreed nor disagreed (28.5%). More than half (55.7%) of authorizers disagreed that enforcing enrollment proportionality is an autonomy infringement, while 16% of authorizers agreed or strongly agreed and 25.7% of authorizers neither agreed nor disagreed. Similarly, just under half (45.8%) of authorizers disagreed that charter schools should have full autonomy—within federal and state law—in recruitment and enrollment of students with disabilities, while 23.7% of authorizers either agreed or strongly agreed, and 28.5% neither agreed nor disagreed. Analytic models (i.e., analysis of variance and logistic regression) were created to predict authorizer beliefs and practices using the type of authorizer (e.g., school district, higher education institution, independent chartering board) and the number of schools in the authorizer’s portfolio. requiring changes to school remediation/action plans. None of the models significantly predicted authorizer perspectives (e.g., perspectives about proportionality, enforcement, autonomy infringement, etc.) and the type of authorizer did not predict authorizer beliefs or practices. Model findings are available upon request. Since 2008, NACSA has annually surveyed our nation’s authorizers. Along the way, we have learned about current practices, challenges, strengths, and shortcomings in authorizing. Survey findings provide an annual measuring stick for those in the field of authorizing, and they help education decision makers, foundations, legislators, and researchers inform their understanding of the field of charter school authorizing. The 2015 survey asked authorizers to complete 107 questions on a range of topics related to charter school authorizing, as well as perspectives and practices on discipline and special education. Typically the authorizing organization’s day-to-day decision maker (e.g. 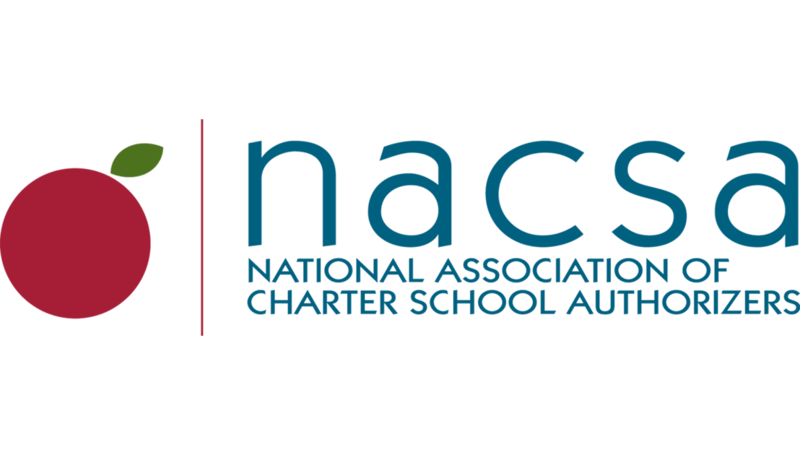 charter school director, executive director, superintendent) responds to NACSA’s survey, not authorizer governing board members. Thus, data drawn for this paper represent the perspectives and practices of authorizers as understood and executed by day-to-day decision makers, and are not necessarily an official position of the authorizing institution. NACSA intentionally seeks a near universal sampling of authorizers with large portfolios (authorizers overseeing 10 or more schools) resulting in an expansive and representative sample of those authorizers, but also in underrepresentation of other authorizers. The sample of authorizers participating in the survey (N=164) includes authorizers from every state with charter schools. They collectively oversee just over 70 percent of all U.S. charter schools. Approximately 75 percent of all large authorizers participated in the 2015 survey, and the sample is highly representative of those authorizers (by portfolio size, type, and region). The authorizer to school ratio in this sample is 1 to 28.0 (or 28 schools per authorizer), compared to an approximate national rate of 1 to 6.5 (or 6.5 schools per authorizer). Relative to all authorizers nationally (irrespective of portfolio size), the sample contains a lower proportion of school district authorizers (61 percent compared to 90 percent nationally), and a slightly higher proportion of higher education, independent chartering board, state board/department of education, and not-for-profit authorizers. The sample also contains a lower proportion of authorizers from the western U.S. (35 percent compared to 49 percent nationally) and a higher proportion of authorizers from southern states (28 percent compared to 15 percent nationally).